With bilateral trade between India and the GCC countries historically strong, and getting stronger, Legally India asks Manish Narayan of Galadari Advocates how businesses on both sides should handle litigation risks. Where do you see the greatest avenues for business between India and the Gulf states? Talking specifically in terms of sectors, renewable energy and infrastructure are on the forefront as both countries are moving towards strengthening their foothold in the international economy and leaving a mark globally. With the advent of tourism in recent times, the hospitality and hotel industry is yet another promising sector to watch out for along with information technology, defense and healthcare. According to a recent report of the Dubai Land Department, Indian nationals emerged as one of the top investors in the Dubai real estate market in terms of both, volume and value of investment as compared to other foreign investors. Increasing investor confidence and growing bilateral relations between the two nations has led to the recent decision of the Dubai Chamber to open a representative office in Mumbai. This strategic move will boost cooperation between business communities on both sides. The India office of the Dubai Chamber is being set up with the aim of assisting UAE-based companies that want to invest in the Indian market. The office will also work to promote Dubai as a lucrative trade and investment hub, and attract Indian companies that plan to expand to Dubai and access markets in the Middle East. How do businesses and lawyers from the region perceive India as an investment destination? India has continuously been emerging as an investment destination for business houses in the Gulf countries and more particularly, the UAE. With enhanced political co-operation between India and the UAE coupled with strategic decisions taken by the heads of the states in recent times, investments to India have increased substantially in the past few years and will continue to grow in the coming years as well. Political changes and policy reforms in India have contributed to increasing investor confidence and have boosted the flow of inbound foreign investments especially in sectors such as infrastructure, food processing and oil and gas. In addition, investments by Non Resident Indians (NRIs) residing the GCC, form a considerable chunk of the investments into India. As lawyers, we continuously advise clients on making investments in India and assist them in making a sound and informed decision by conducting thorough legal due diligence. We also provide sector specific information in association with leading law firms in India. Recently, we have seen a surge in the number of multinational corporations, high net worth individuals and even small businesses keen to channel their funds into investments in India. What are the main cultural and/or legal differences between doing business in the Gulf and India? Politically, legally as well as culturally, India and the UAE are two very diverse nations, each having unique challenges in terms of legal procedures as well as conducting business. While India’s legal regime is structured around the common law system, UAE is a civil law based jurisdiction. Arabic is the local language in the UAE and legal proceedings are conducted in Arabic. The UAE legal system does not recognize the doctrine of precedents or the common law principles of reasonableness and balance of probability. Injunctive relief is granted only in certain exceptional cases and oral hearings are fairly limited with heavy reliance placed on documentary evidence. Rights of cross-examination are also restricted and hence litigation in the UAE is vastly different from litigation in India. In terms of the business environment, the UAE is a heavily regulated and legislated market for foreign investments. While most Emirates have their own legislation on foreign investments, typically, foreign ownership in businesses is limited to ensure local participation. At present, in mainland Dubai, foreigners apart from nationals of the Gulf Cooperation Council (GCC) countries, are allowed to own up to forty-nine percent of the shares in a commercial limited liability company with the balance shares being owned by a local UAE national. However, the owners are free to decide the profit sharing ratio, which need not be congruent with the shareholding. There are also designated free zones within the UAE, which operate as distinct legal jurisdictions governed by their own regulations and procedures. Typically, 100% foreign ownership of businesses is allowed in the free zones. One such coveted free zone is the Dubai International Financial Centre (DIFC), which is a leading global financial hub for the Middle East region. Having its own independent regulator as well as a global financial exchange, it attracts investments from wealth funds, trusts and financial institutions all across the globe. With its own set of legislation issued in English and an independent judicial system modeled on the English common law framework, litigation and arbitration in the DIFC are increasingly being favored by businesses in the region. With regards to investment in property and real estate in the UAE, freehold ownership of real estate is restricted to certain notified areas for foreign nationals. Most emirates in the UAE have their own local laws pertaining to foreign ownership of real estate. In Dubai, foreigners can lease property for a short term (not exceeding ten years) in all areas in the emirate. However, long term lease and freehold ownership is regulated and restricted to UAE and GCC nationals, companies owned wholly by UAE and GCC nationals as well as public joint stock companies. Foreign nationals may obtain a long term lease or freehold ownership in property only in certain designated areas as approved by the Ruler of Dubai from time to time. What do UAE companies most often require from their dispute resolution clauses in agreements with Indian companies? UAE based companies prefer to settle their claims by litigation in the Dubai Courts or the DIFC Courts. While legal proceedings in the Dubai Courts are conducted in Arabic, English is the language of operation of the DIFC Courts. However, in complex cross border transactions with high stakes involving large sums of money, arbitration is the preferred dispute resolution mechanism. Typically, we advise clients on the ideal dispute resolution forum based on the parties concerned, the purpose of the transaction, activities proposed to be carried out and the jurisdictions involved. What are the most popular arbitration venues for UAE companies working with Indian companies? For cross border transactions involving large sums of money, arbitration is generally the preferred alternate dispute resolution mechanism. Arbitration in the UAE has come a long way and is now seen at par with international best practices. While there are various arbitration forums in most emirates, centers in Dubai and Abu Dhabi are more popular amongst businesses. The Dubai International Arbitration Centre (DIAC) is currently the busiest arbitration center in the nation with the default language of arbitration proceedings being English. The Dubai International Financial Centre (DIFC) has arbitration rules based on the UNCITRAL Model Law on International Commercial Arbitration and is commonly chosen as the seat of arbitration. Within the DIFC, another forum is the DIFC-LCIA Arbitration Centre which has been set up in collaboration with the London Court of International Arbitration (LCIA). The enforcement and ratification of DIFC arbitration awards is done by the DIFC courts based on the common law framework. Apart from Dubai, arbitration in the Abu Dhabi Commercial, Conciliation and Arbitration Centre (ADCCAC) is also popular and is the preferred venue for Abu Dhabi based companies. How does enforcement of arbitration awards in the UAE differ from enforcement of Indian court awards? In principle, foreign court judgments will be enforceable in Dubai if they are pronounced by a country, which has a treaty with the UAE for reciprocal recognition of judgments. However, practically, it is difficult and cumbersome to enforce foreign judgments, especially those which involve Dubai based companies as the local courts assume jurisdiction in such cases. 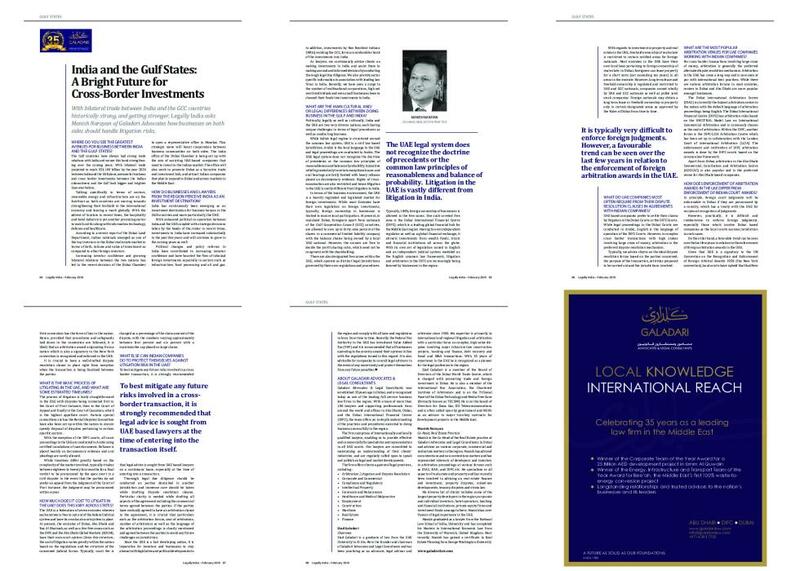 On the other hand, a favorable trend can be seen over the last few years in relation to the enforcement of foreign arbitration awards in the UAE. Given that UAE is a signatory to the UN Convention on the Recognition and Enforcement of Foreign Arbitral Awards 1958 (the New York convention), local courts have upheld that that New York convention has the force of law in the nation. Hence, provided that procedures and safeguards laid down in the convention are followed, it is likely that an arbitration award originating from a nation which is also a signatory to the New York convention is recognized and enforced in the UAE. It is crucial to have a well-drafted dispute resolution clause in place right from inception when the transaction is being finalized between the parties. What is the basic process of litigating in the UAE, and what are some estimated timelines? The process of litigation is fairly straightforward in the UAE with disputes being contested first in the Court of First Instance, then in the Court of Appeal and finally in the Court of Cassation, which is the highest appellate court. Various special committees such as the Rental Disputes Committee have also been set up within the nation to ensure speedy disposal of disputes pertaining to certain specific sectors. With the exception of the DIFC courts, all court proceedings in the UAE are conducted in Arabic using certified translations of case documents. Reliance is placed heavily on documentary evidence and oral pleadings are rarely allowed. While timelines differ greatly based on the complexity of the matter involved, typically it takes between eighteen to twenty four months for a final verdict to be pronounced by the apex court in a civil dispute. In the event that the parties do not prefer an appeal from the judgment of the Court of First Instance, the judgment may be pronounced within a year. How much does it cost to litigate in the UAE? Does this vary across states? The UAE is a federation of seven emirates wherein each emirate is free to opt out of the federal judicial system and have its own local court system in place. At present, the emirates of Dubai, Abu Dhabi and Ras Al Khaimah, as well as a few free zones such as the DIFC and the Abu Dhabi Global Markets (ADGM), have their own court system. Given this structure, the cost of litigation varies greatly within the nation based on the regulations and fee structure of the concerned judicial forum. Typically, court fee is charged as a percentage of the claim amount of the dispute, with the numbers varying approximately between four percent and six percent with a maximum fee cap placed on large claims. What else can Indian companies do to protect themselves against litigation risk in the UAE? To best mitigate any future risks involved in a cross border transaction, it is strongly recommended that legal advice is sought from UAE based lawyers on a continuous basis, especially at the time of entering into a transaction. Thorough legal due diligence should be conducted on parties domiciled in another jurisdiction and immense care should be taken while drafting dispute resolution clauses. Particular clarity is needed while drafting all aspects of the agreement including the commercial terms agreed between the parties. If the parties have mutually agreed to have an arbitration clause in the agreement, it is crucial that particulars such as the arbitration forum, seat of arbitration, number of arbitrators as well as the language of the arbitration proceedings is clearly mentioned and agreed between the parties to avoid any future challenges on jurisdiction. Since the UAE is a fast developing nation, it is imperative for investors and businesses to stay abreast with legislative and political developments in the region and comply with all laws and regulations in force from time to time. Recently, the Federal Tax Authority in the UAE has introduced Value Added Tax (VAT) and it is recommended that all businesses operating in the country amend their systems in line with the regulations issued in this regard. It is also advisable for companies to consult legal advisors in the event of any uncertainty and protect themselves from any future penalties. 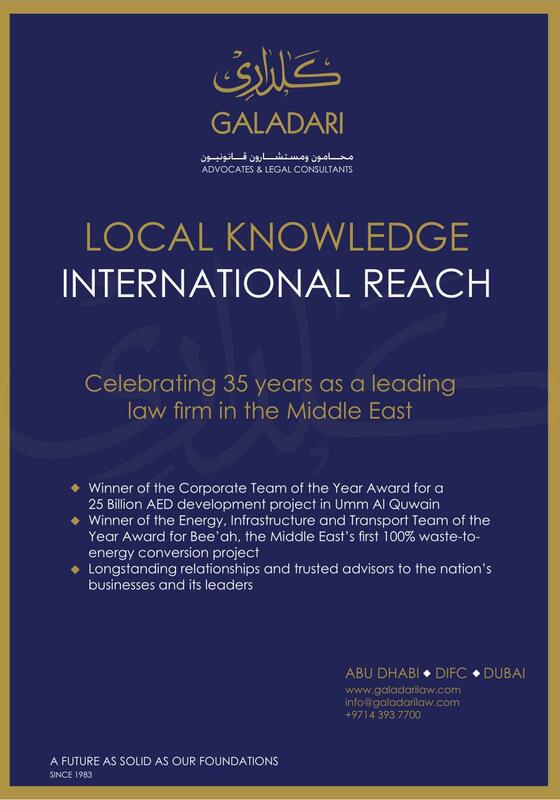 Galadari Advocates & Legal Consultants was established 35 years ago in Dubai, and is recognized today as one of the leading full service business law firms in the region. With a team of more than 100 lawyers and supporting professionals from around the world and offices in Abu Dhabi, Dubai, and the Dubai International Financial Centre (DIFC), the team offers an in-depth understanding of the practices and procedures essential to doing business successfully in the region. The firm comprises of internationally and locally qualified lawyers, enabling us to provide effective and commercially focused advice and representation in all UAE courts. Our lawyers are committed to maintaining an understanding of their clients’ industries, and are regularly called upon to speak and publish on legal and market developments. Ziad Galadari is a graduate of law from the UAE University in Al Ain. He is the founder and chairman of Galadari Advocates and Legal Consultants and has been practicing as an advocate, legal advisor and arbitrator since 1983. His expertise is primarily in international and regional litigation and arbitration with a particular focus on complex, high-value dis­putes involving major infrastructure construction projects, banking and finance, debt recovery and fraud and M&A transactions. With 35 years of experience in the UAE he is recognised as a pioneer for the legal profession in the region. Ziad Galadari is a member of the Board of Directors of the Dubai World Trade Centre, which is charged with promoting trade and foreign investment in Dubai. He is also a member of the International Bar Association, the Chartered Institute of Arbitrators and is on the Tribunal Panel of the Dubai Technology and Media Free Zone (formerly known as TECOM). He is on the board of Directors for Dana Gas, DU Telecommunications and is often called upon by government and NGO’s as an advisor to major turn-key contracts for development projects in the Middle East. Manish is the Co-Head of the Real Estate practice at Galadari Advocates and Legal Consultants in Dubai and advises on various corporate, commercial and real estate matters in the region. Manish has advised on contentious and non-contentious matters and has represented interests of developers and investors in arbitration proceedings at various forums such as DIAC, RAK, and DIFC etc. He specialises in all aspects of real estate and property and has recently been involved in advising on real estate finance and investment, property disputes, mixed-use developments, tenancy disputes and strata law. His diverse list of clients includes some of the largest property developers in the region, corporate and individual investors, hotel operators, banking and financial institutions, private equity firms and investment funds amongst others. Manish has over 9 years of legal experience in the UAE. 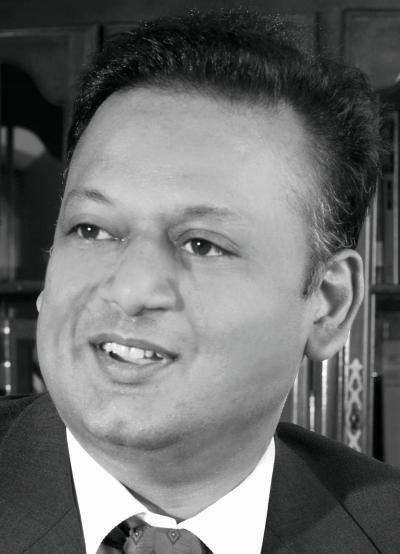 Manish graduated as a lawyer from the National Law School of India, University and has completed his Masters in International Economic Law from the University of Warwick, United Kingdom. Most recently, Manish has gained a certificate in Real Estate Planning from George Washington University.